Infographics helps explain complex ideas, like this one that shows the cost of the conflicts in Georgia. An infographic is a powerful tool that can help explain something. Infographics present information visually and in an entertaining way. This can help watchers, listeners and readers understand the subject of interest. You can use infographics on social media, in presentations or just for fun. BitRebels.com says the human brain absorbs ideas presented in infographics three times faster than ideas presented in simple text. The easiest way to create infographics is to start with a template you can fill with facts. With most infographic templates, you can add images, icons and also backgrounds. Many of these sites let you add your own images from a computer. Type in text, choose fonts and colors, then save your infographic and/or share it on social media. These sites make creating infographics easy and free. 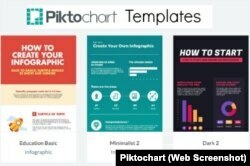 Piktochart is a website filled with infographic, presentation, poster and report templates. 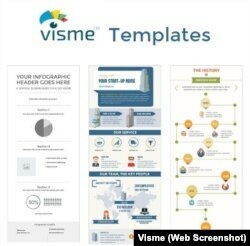 Register for an account and get started by choosing an infographic template. Canva is a free design website to create infographics, social media cover images, invitations, posters, cards and more. Head to the site, register for an account and click Create a Design. Choose Infographic to find free templates. After choosing one, add background designs, images, text, charts and more. Use Canva's free photos or upload your own. 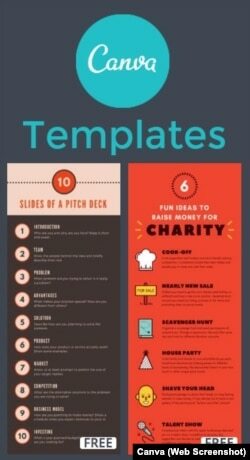 Many of Canva's elements are free, though some cost about $1. Select a background and add text, shapes, charts and objects to your infographic. Add images from Easelly or upload your own. You can add a YouTube video into your infographic. Have you ever wanted to make an infographic? Have you tried any of these infographic tools? Can you suggest any other tools to create infographics? chart - n. information in the form of a table, diagram, etc.